Alexander’s words resonated with me, a Jew who uncritically supported Israel for many years until I saw the parallels between U.S. policy in Vietnam and Israel’s occupation of the Palestinian territories. My activism and critical writings have followed a trajectory from Vietnam to South Africa to Israel to Iraq to Afghanistan and other countries where the United States continues its imperial military actions. Although many of my articles are controversial as they criticize the actions of the U.S. government — under both Democratic and Republican regimes — I get the most pushback from my writings about Israel-Palestine. When I analyze Israel’s illegal occupation and crimes against the Palestinians, I am often called a “self-hating” Jew. In 1967, during my freshman year at Stanford, I came to oppose the war in Vietnam and joined The Resistance, a group of draft resisters and their allies. The following year, I signed up for Students for a Democratic Society, where I learned the war was not an isolated event, but rather part of a long history of U.S. imperialism. But I was still unaware that the war Israel launched in 1967 “completed its occupation of Palestine,” in the words of Peled. The anti-Vietnam War movement at Stanford challenged my long-held assumptions about U.S. foreign policy. My commitment to ending an unjust war against a people fighting for liberation eventually opened my eyes to the plight of the Palestinian people and Israel’s role in repressing them. After college, I went to law school and became a peoples’ lawyer. I joined the National Lawyers Guild, a progressive political-legal organization which I later served as president. The NLG’s guiding motto is, “Human rights are more sacred than property interests.” In the NLG, I met many people who criticized Israel’s illegal policies and U.S. complicity in them. In 1977, the NLG sent a delegation to Israel and Palestine. The report they issued was the first comprehensive analysis of Israel’s practices published by a nongovernmental organization dedicated to the protection of human rights. It documented violations of the 1949 Geneva Conventions by Israel as a belligerent occupant of the West Bank and Gaza. On July 19, 2018, the Israeli Knesset passed a law that illegally enshrines a system of apartheid. The legislation, which has the force of a constitutional amendment, says, “The State of Israel is the national home of the Jewish people, in which it fulfills its natural, cultural, religious and historical right to self-determination.” It continues, “The right to exercise national self-determination in the State of Israel is unique to the Jewish people.” There is no guarantee of self-determination for the 1.8 million Arabs who make up 20 percent of Israel’s population. Alexander describes the silence of many civil rights activists and groups, “not because they lack concern or sympathy for the Palestinian people, but because they fear loss of funding from foundations, and false charges of anti-Semitism.” She mentioned the case of Bahia Amawi, a U.S. citizen of Palestinian descent, who lost her Texas elementary school job last year after refusing to pledge in writing that she would not participate in the BDS movement. On Twitter, journalist Glenn Greenwald pointed out the grave danger anti-BDS laws pose to freedom of speech. 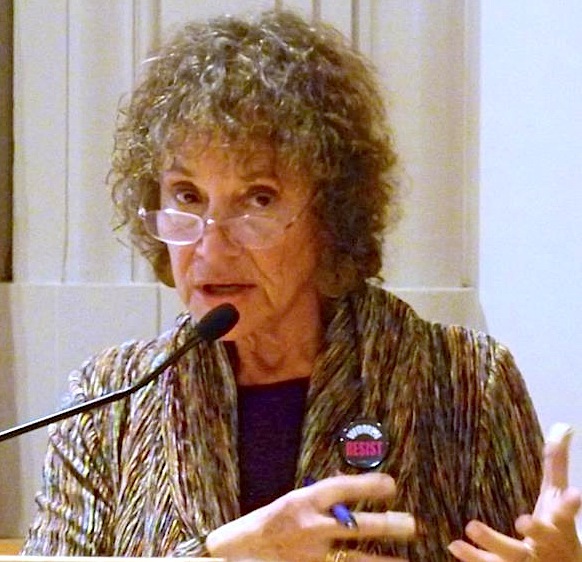 Marjorie Cohn is professor emerita at Thomas Jefferson School of Law, former president of the National Lawyers Guild, deputy secretary general of the International Association of Democratic Lawyers and a member of Jewish Voice for Peace. Her most recent book, “Drones and Targeted Killing: Legal, Moral, and Geopolitical Issues,” contains a chapter analyzing Israel’s targeted killing case.